Good basic case. Reasonable protection. Will see with time what wear and tear does to it but for now it works keeping the S7 safe from knocks. Falling to bits around the edges after only 3 weeks of use. Would not recommend this at all. Total waste of money and you clearly get what you pay for. Cover does not fit correctly have tried to fix it but could not also starting to wear at edge after couple of weeks. Nothing had previous experience of your products - always satisfactory. Just as it says on the tin. The delivery service was second to none with it arriving a day before it was expected. Very reasonable price and arrived as usual. Very efficient and professional company. Case looks great and for the price, very good value. Wouldn't have the same protection in a fall on the top or bottom as dearer products but then its 30 euro cheaper. Was really impressed with my leather wallet for galaxy 7 phone very practical. Very impressed with galaxy 7 wallet, better than expected. Will purchase again. This item arrived on time. It is a quality product and I am very pleased with it. Got the right product albeit delivery by Australia Post was very slow. MobileZap's price was half the cost of the next cheapest i found. Excellent service and amazing price! 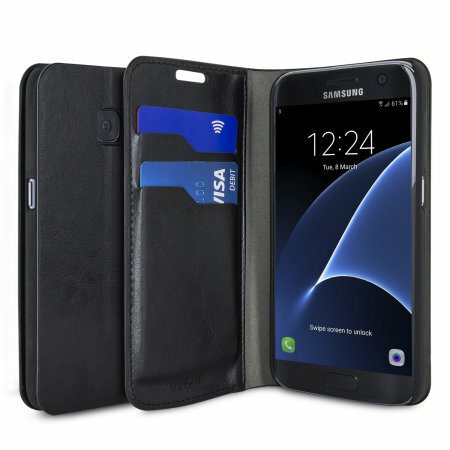 Excellent Samsung s7 wallet case. Light yet sturdy stylish and elegant case. Fits perfectly and great value for money. Nice slim phone wallet looks good fits well. However feels a bit flimsy and the phone is too heavy for the stand and slips down when trying to use it.